We are pleased to announce the introduction of Circle community acupuncture at All One. It will be geared to help people with addiction recovery (quit smoking), hormonal imbalances and stress management through acupuncture. With our affordable rates, I want to make it possible for patients to receive frequent treatments and have access to acupuncture even when they can’t afford the individual sessions. What we need from you, to make this available to you and others, is referrals. If your experience is positive then please share it with others, ask them to come and experience acupuncture! Affordable All One Community Acupuncture: For many thousands of years, acupuncture has been a “people's medicine”: low-tech, inexpensive, easily available, and very quiet. Acupuncture is a process. It is very rare for any acupuncturist to resolve a problem with one treatment. Acupuncture is most effective when administered frequently. That is the way acupuncture is practiced in China and other Asian countries to achieve rapid and consistent results. This model has some shortcomings and limitations - the limited number of points accessible and minimal time spent with each client. It works best in combination with full body private one-on-one treatments. Nevertheless it is very successful for addiction recovery (e.g. smoking cessation) and stress management or wrist/elbow/knee pain. Patients receive acupuncture in small groups while seated in comfortable armchairs. All you need is to roll up your sleeves and remove your socks. 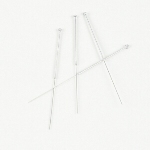 Needles are placed primarily on ears, arms, legs, face. Appointment times are staggered throughout the hour allowing us to give high-quality, personalized care to multiple patients, which permits us to lower our fees and make Chinese medicine accessible to a greater number of people. Due to the higher cost of private one-on-one treatments common in Canada, people normally receive acupuncture not as often as required to see the benefits. For some the cost makes it prohibitive. When treated with greater frequency, you can see and feel faster improvements in your condition. Circle Community Acupuncture's fees allow you to see your acupuncturist more often. Depending on your constitution and your condition, we may encourage you to come in multiple times in one week. [ For your first visit, please arrive 10-15 minutes early in order to fill out a few forms and get oriented to the space. [ I will meet with you privately before your first treatment to discuss any concerns and health history, take your pulses, look at your tongue and ask a few questions. [ After your intake you will join the circle, find a comfortable armchair, roll up your sleeves and remove socks...I will place your needles, and leave you to rest. Your treatment will last around 25 minutes. This kind of collective stillness is a rare and precious experience. Please help us to maintain that by speaking in whispers and refrain from socializing while in the room. Part of the success of the flow of the treatments lies in patients learning "the routine" and taking responsibility for appointments. Re-scheduling and making payment happens at the front desk before each treatment, so you can relax and enjoy treatment. We accept debit/cash/personal cheques. Please remove shoes as you enter, turn off your cell phone, and use a soft voice. [ Make sure you are not hungry before a treatment. [ Please wear loose, comfortable clothes. [ Feel free to bring whatever you need to make yourself comfortable such as a favourite shawl or blanket, or earplugs. [ If possible, avoid caffeine for two hours before treatment. [ Some patients might be sensitive to smells - avoid the strong ones. [ Try to avoid very strenuous activity after your treatment. My goal is to make Chinese medicine accessible to more people by making it affordable. For that reason I decided to offer in addition to my individual acupuncture treatments practice time dedicated to a circle community acupuncture. [ All One Community acupuncture will be geared to help people with addiction recovery (quit smoking), hormonal imbalances and stress management through acupuncture. [ These treatments focus on above conditions and are not intended to address other medical issues. Of course, if your level of stress is reduced, it has a positive effect on your overall health. [ This system will not allow for long private consultations. Some conditions can’t be helped effectively without clinical acupuncture session (full body), herbs and use of other modalities of TCM. I will make appropriate suggestions based on my experience treating different kinds of conditions. [ If you think you need to adjust your treatment plan, please let me know. I need you to commit to the process of treatment in order to get good results. NOTE: We have a 24-hour advance notice cancellation policy. No shows, missed appointments and same day cancellations will be charged $20.00.